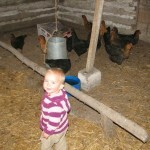 This year we decided that we were going to raise our own laying hens. It will be a great experience and a bit of a science project for Dinah and J3. 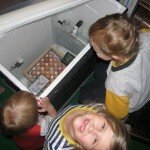 We collected eggs on the week of Feb. 22, and set them in the incubator on Feb. 27th. So we are expecting them to hatch out on or around March 20th. 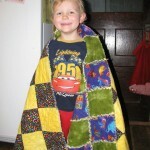 I will be adding more blog posts as things develop. Enjoy these pictures of us collecting eggs, building our incubator, and candling the eggs at day #3. Also, check out the video after the pictures! Here is a video we just made of candling an egg this evening. This is on Day 10 of the 21 day incubation. It’s hard to see in the beginning because of the poor video quality, but some veins are visible on the left side of the egg. Later in the video you can see the embryo more clearly and it is also moving around a lot. Random awesome things that happened in the last quarter of 2009. O.K. So I’m too lazy to separate all this stuff into separate posts. Deal. I’m just about to head off to bed, but had to share this wacky Saskatchewan weather with everyone. We’ve had a mix of rain and snow throughout the day here, but it didn’t actually start accumulating until late in the evening. 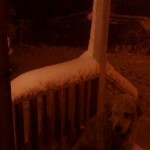 The next thing I know, we are snowed in again! Check out the pictures. EDIT: Added some daytime pictures! Last week our old well finally ran dry. They had warned us about it when we moved in, and so we had a new well dug last year. 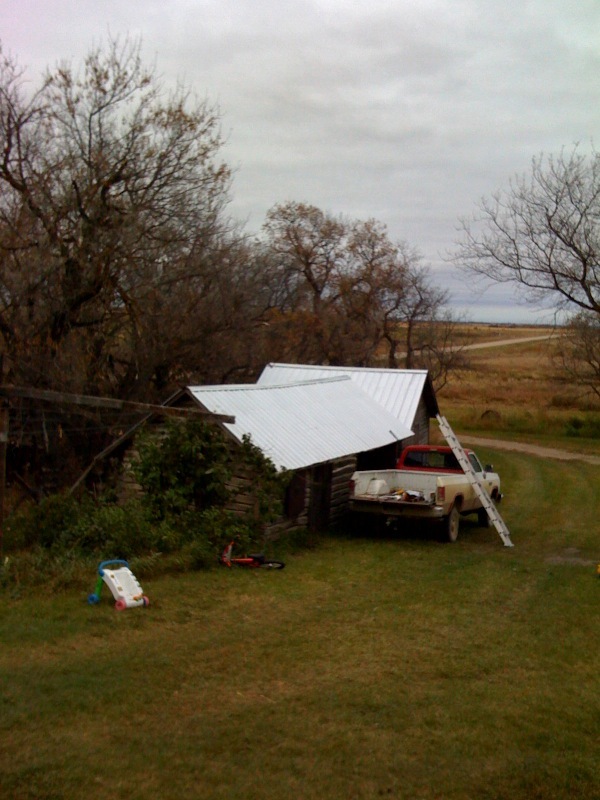 It was a rather wet year, however, and we were never able to get the new well hooked up. So now we were in a bit of an emergency situation. Fortunately we were able to get a neighbor who does excavating to come out on Monday. 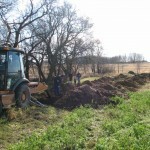 He did the trenching for us and we got power and pipe out to the new well. We now have 50 glorious pounds of constant water pressure due to our new water system being 100% functional! Thanks also to Uncle Stan, who is staying with us for a week and who we were able to force into slave labor. Check out some pictures from the day by clicking on the thumbnail to the upper-left of this post, or by clicking on the post title. Or, if you can already see all the thumbnails below, click on one of them to blow it up. Jack and I got another building roofed today. We’re in a rush to get these buildings done because the snow will be flying soon! It’s actually just above freezing now, and we just finished. So the cold weather is already taking its toll! The prognosticators have issued a Winter Storm Watch for tomorrow, and say that we are likely to get a few inches of snow. We’ll be having Thanksgiving dinner tomorrow, and Thea has been “Susie Homemaker” today while I’ve been crawling around up on the roof. Turkey, dressing, sweet and mashed potatoes, broccoli casserole, and pumpkin pies…. I can hardly wait (or stop drooling on my keyboard)! We finally have our first real farm animals: a dozen chickens that Aunt Martha raised for us. They are starting to lay eggs for us (yum) already. Also shown here are a few of our cats and our puppy Sneakers. Sneakers is a Golden Retreiver crossed with a Great Pyrenees. We are hoping she will be a great “coyote killer” and keep all of our other animals safe at night! Also, I’ve included some pictures of a few of our out-buidings. We are trying to get a number of them covered with steel roofs before the snow flies.